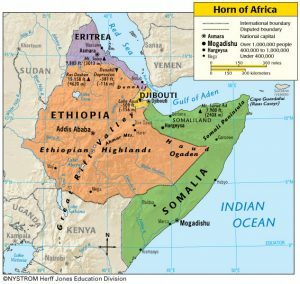 The World Heath Organization has reported an ongoing investigation into a wild poliovirus type 1 (WPV1)in the Horn of Africa. Current cases include a 4 month old child in Kenya who developed symptoms on April 30th, 2013; two cases who were in contact with the child also tested positive for WPV1. These are the first laboratory confirmed cases in Kenya since July 2011. There has also been a case confirmed in Somalia on May 9,2013. On May 14th, 2013 a vaccination campaign was launched in Somalia and reached 440,000 children. The second round of vaccinations will be launched May 26,2013 in the affected parts of Kenya. There is a high risk of transmission to neighboring countries due to large population movements and immunity gaps in several areas. An alert has been launched to all countries across the Horn of Africa indicating the need for active searches for suspect WPV1 cases. All countries are advised to take measures to fill in the immunity gaps. The last polio outbreak in 2005 spread across the east of the African continent and into Yemen and the Horn of Africa; there was 700 cases reported at that time. There has been developments since then for international outbreak protocol and oral polio vaccines have been developed which can reduce the severity and length of polio outbreaks. Travellers are advised to seek travel heath advise prior to arriving in endemic areas to ensure they are up to date on their polio vaccine.